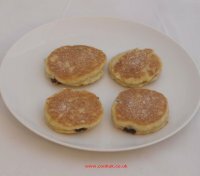 These pages have a range of recipes which your children and kids can cook. They range from the simplest of all, making butter, to the slightly more complex, making bread. All the recipes have been tried at least twice by a nine old. The recipes clearly say where adult help may be required but the final judgement is up to you. Only you know your child's abilities. Each recipe has step by step pictures. Just click on any entry below for complete instructions. Combines crunchy celery, topped with a thick layer of peanut butter and whatever chocolate pieces are available. Pastry Shapes for children (with a little adult help) to cook. Very simple, very tasty and probably our most engaging recipe for children. Simple ingredients, simple instructions and lots of step by step pictures to help. Simple ingredients, simple instructions and lots of step by Not only will your kids enjoy helping to make the mixture they will also love to decorate them using their own ideas. This is a traditional Czech Republic recipe. 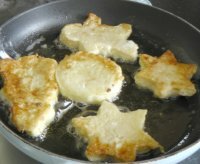 Bear's Paws are really tasty biscuits and we show how your lids can bake them with step by step pictures and instructions. This children's shortbread recipe is easy to make and delicious to eat. Bake this cake at any time of the year, not just Halloween. Make it as scary as you like! A fun way to serve spaghetti bolognaise by decorating it with vegetables. 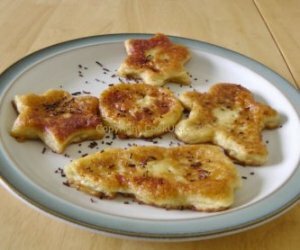 Get your kids cooking with this eggy bread recipe for children. Small finger sized shapes topped with chocolate make them irresistible. This is a great kids favourite especially with the tasty butter icing. Although they look complicated in the picture they are actually very easy for kids to make. This is made out of two bagels, egg mayonnaise and tuna mayonnaise. It's fun to make and great to eat. These sandwiches look really professional but they are so easy for children to make. This is one of the easiest recipes for children to make. No cooking, no knives, nothing complicated, just fun to make and even more fun to eat! Traditional jam tarts are another recipe for children to cook. All the family and friends will love these. 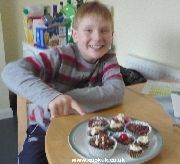 These are our personal favourite recipe for children to make and cook. Chocolate Coated Flapjacks, just too delicious for words. The children will love to cook these. Make your own butter using only cream and a jam jar! The delicious aroma will prove to them that they are master cooks! Tasty treats that both kids and adults like. They are short on preparation effort and only take 6 minutes to cook. Give them a try, they are delicious. Simplicity itself to make, these Chocolate Krispies can largely be made by your kids. They will certainly have no problem eating them and can be amused by applying lots of decorations. Only three ingredients and no cooking make this an ideal recipe for your kids to make. It's fun to make and very, very tasty.